Bring in 2019 we’re ready! Just better be as good as 2018!! 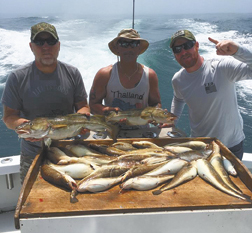 Granted the offshore Canyon fishing needed some improvement, but inshore fishing was full of action. Well, the Fluke were a little sluggish for 2018, but the shear numbers of 17-18 inch Fluke was a great sign for the future!! Plenty of action with the Fluke at just about all the rips north of the lighthouse, they just needed to grow up a little. The bigger Fluke were around, you just had to work for them. When Fluking is tough look for the bait on your bottom machine. Drill it out around the bait and try to find a slope to the bottom, set up your drift to either go up the slope or down the slope if possible. Fluke move around a lot looking for food, when it’s tough fishing try different spots where there is some hard bottom (rocky) alongside a sandy bottom. Now if there is some bait present, you should be in business. Following the party boats isn’t always the answer, because when fishing is tough, they’re looking for them too!! Also when it’s tough fishing for the Fluke fresh bait and presentation is more important than ever! 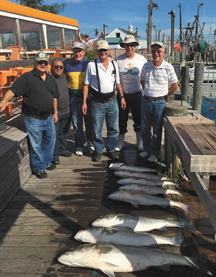 Porgy, Black Sea Bass, Striped Bass were all in good shape in 2018. It was amazing to see in the Fall the immense numbers of juvenile Striped Bass. 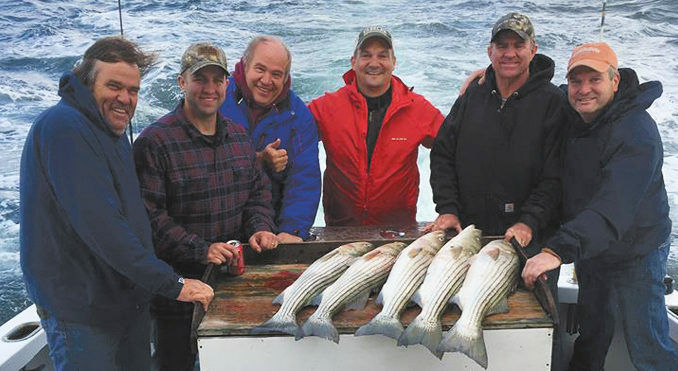 From east of the Porgy Lump to down off of town there was Striped Bass boiling on the surface gorging themselves for their trip up the Hudson and down to the Chesapeake. Proof that regulations do work, even though they may not always be accurate. 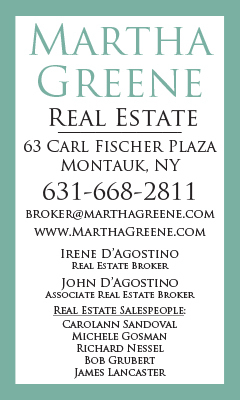 There are so many more people with their own boats these days, the Striped Bass get beat on like a drum. Take what you need and release the rest and the stocks will remain healthy. Watching a 30-40 pound Striped Bass swim away to fight again is a pretty good feeling, try it sometime, and don’t forget to video it!!!! With a new season coming there will probably be some regulation changes, hopefully for the better. Stocks of Porgy, Black Sea Bass, Striped Bass, and even Fluke (even though they were undersized) seem in pretty good shape. An accurate assessment is all we can hope for, so keep your fingers crossed! Hope everyone has a good winter and wishing everyone a Healthy, Happy, and Prosperous New Year!!! 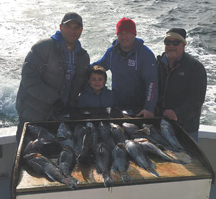 Looking forward to yet another action packed fishing season in Montauk for 2019! !